To my fellow runners: Have you ever had this experience--where you are running (race or training run) and find your mind filled with negative self-talk? Why did I register for this race? I can't DO this! I can't keep up with [other runner]! What's WRONG with me?!?!? No, not a HILL! This will kill my pace! Chances are, if you run, you have first-hand knowledge of the destructive potential (and pervasiveness) of thought patterns like these. What if you could turn around the way you think, so your thoughts can boost your performance and overall fitness? Whether this is something you've personally mastered or something you aspire to, I believe you will find value in this Deena Kastor book. 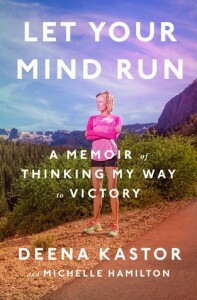 Deena Kastor started running as a middle-schooler, taking to the sport after her parents had encouraged her to try a variety of activities. Soon she was winning races, and those wins carried through into high school. In those early days, pure talent was fueling the victories. Races were for running hard, and practices were for having fun. When the wins became harder to come by, that was modified to hard running for races AND practices. The high-school running led to a scholarship to university in Arkansas, but by the time she graduated, running had lost its luster. Deena was on the verge of pursuing a career as a baker when a friend encouraged her to train with a coach in California and give professional running a try. A phone call with the coach convinced her to move to his town. They clicked, and part of Deena's journey as a runner involved learning to use positive thinking to support her training and racing. 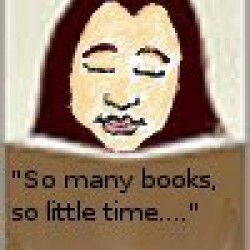 She cites many of the sources she consulted, which readers might be interested in checking out on their own. Along the way, she married Andrew Kastor, had a baby girl named Piper, steadily progressed and set records in a variety of distances, from 5k through marathon, and eventually formed her own racing team--benefiting from her and Andrew's knowledge. This book is relevant to me as a runner, and I can't comment on whether non-runners would be interested in it (though anyone can use positive thinking for various pursuits). But this is definitely a great choice for runners, especially those looking for strategies to get out of their own way and train their brains to help rather than hinder their progress.